Welcome back to Day 16 of Freedom from Clutter in 40 Days. If you are tired of the burden of clutter then this series is for you. Day by day we are getting rid of the items that weigh us down, slow us down, and get in the way of having time to spend with our families. Today, I have a treat for you. Our friend Lydia over at Life Beyond the Kitchen and Lydia’s Flexitarian Kitchen is sharing her struggles with decluttering flat surfaces in her home. I think this is a common problem for many of us and I have to say that it feels so much better to know that I’m not alone. My family drives me crazy because every time that I clear a flat surface, they take it as an invitation to dump their junk in the open space. Anyone else have family members like this? 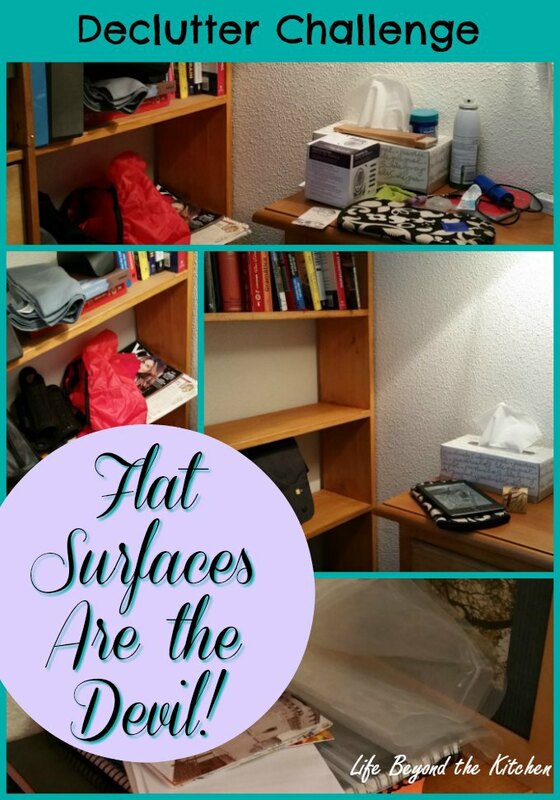 Hop over to Life Beyond the Kitchen and read Lydia’s experience with clearing flat surfaces. She has given me some hope for the flat surfaces in my home. Still here? Ok…………click here to get over to Lydia’s article. Make sure to leave Lydia a comment to share your experiences with flat surfaces. Check back each week for more from Lydia during our Freedom From Clutter in 40 Days series. Want more? Keep reading Freedom from Clutter in 40 Days by clicking the image below. You have already helped me. Sometimes you just need a friend to help you see things in a different light. Thanks a bunch!